In a small-budget, online announcement on Thursday, former Virginia senator Jim Webb and his family stepped into the national spotlight. Webb is now the fifth Democrat to announce his candidacy for the Democratic presidential nomination. With his unique background and views, Webb is poised to potentially sweep up favor among moderate voters. Webb, who acknowledged that his campaign won't be as highly funded as others, chose to forgo a rally or video, and instead wrote an impassioned letter on his site explaining his decision to run. And, in addition to being a bestselling author and prize winning journalist, Webb is also the only combat veteran currently running, a fact that will likely prove to be a cornerstone of his campaign. To say that Webb is a colorful candidate would be an understatement. No other candidate currently running can boast to being an executive producer of a box-office hit, and it's unlikely any of his Democratic competitors share his love and appreciation of the Confederate flag and Confederate supporters in general. However, on one thing, Webb and the other candidates are alike: They all enjoy a large and loving family. Webb's is a little larger than most though — in addition to his current spouse and six children, Webb has two ex-wives. Hong Le Webb, the former senator's current wife, is a South Vietnamese native who fled to America in 1975 at age 7 when Saigon fell. Since coming to the States, Hong has been making the most of the American dream. A busy and esteemed lawyer, she married Jim Webb in 2005 and gave birth to their daughter Georgia Le Anh the next year. Although she shies away from the spotlight, when Webb does speak she's incredibly moving. She often speaks of leaving Vietnam, as well as Hurricane Katrina, which severely impacted her family members in 2005. Like her husband, Webb has been married before and has a daughter Emily, whom Jim Webb adopted. Jo Ann Krukar and Jim Webb married in 1981, and together they have three children: Sarah, Jimmy, and Julia. Krukar is a powerhouse of a woman. Krukar is currently a health care lobbyist and has a long history in the health care profession. She's worked at Walter Reed Hospital, been an Army public health officer, and received a commendation medal for her medical services in Vietnam. In 1989, she was appointed by President George H.W. Bush to be the director of the National Cemetery System. Barbar Samorajczyk is a lawyer and councilwoman for Anne Arundel County in Maryland. Samorajczyk is Webb's first wife, and they divorced in 1979. They only had one daughter together, Amy, who has been instrumental in her father's campaign. Samorajczyk also has three grandchildren. Not a lot is known about Jim Webb's only son, Jimmy, but he was a driving force of his father's 2006 senatorial campaign. 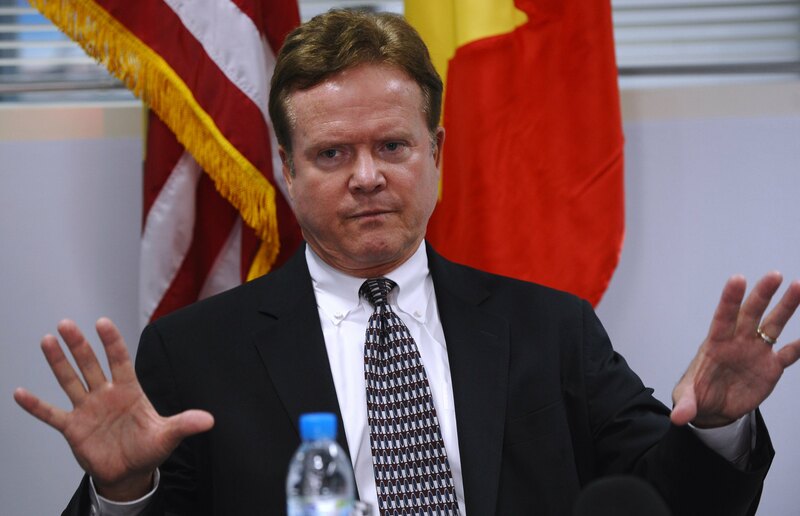 Jim Webb the younger is a rifleman and Marine Sergeant, who was deployed on a tour of Iraq before his father's campaign. To show his opposition to the Iraq war and support for his son and other soldiers, Webb wore his son's combat boots everyday during his campaign. Jimmy Webb has appeared beside his father multiple times in uniform at state functions. Amy Webb Hogan, Webb's firstborn, made headlines last year when Business Insider reported that Hogan was paid part of $90,000 by a PAC in her father's name. While Webb's wife Hong Le received a portion, the majority went to Hogan. After the story broken, Hogan and her father explained that the money was used to update Webb's personal website, as well as fund a presidential exploratory committee. Hogan handled part of the redesign and content creation for the site, and, according to Webb, was reimbursed accordingly. Not much is known about Webb's other daughters Sarah and Julia, or his step-daughter Emily. Undoubtedly, all will be present when Webb hosts his first major rally, and with a family this large, we can't wait to see how they react to a national spotlight.